Social media promotions are still trusted by impulse shoppers, despite counterfeits. Black Friday starts Friday the 23rd of November, followed by Cyber Monday on Monday the 26th of November. The shopping holiday is a dream come true for many authentic brands, with 2017 seeing vendors reach a record $5 billion in online sales. This is unsurprising, considering the day’s name previously referred to when many retailers started turning a profit for the year - going from the red to the black. However, Black Friday is also a huge opportunity for counterfeiters - during last year’s Black Friday, fake product vendors netted an estimated $482 million in online sales, and Red Points’ detection software saw a 16% spike in infringements. 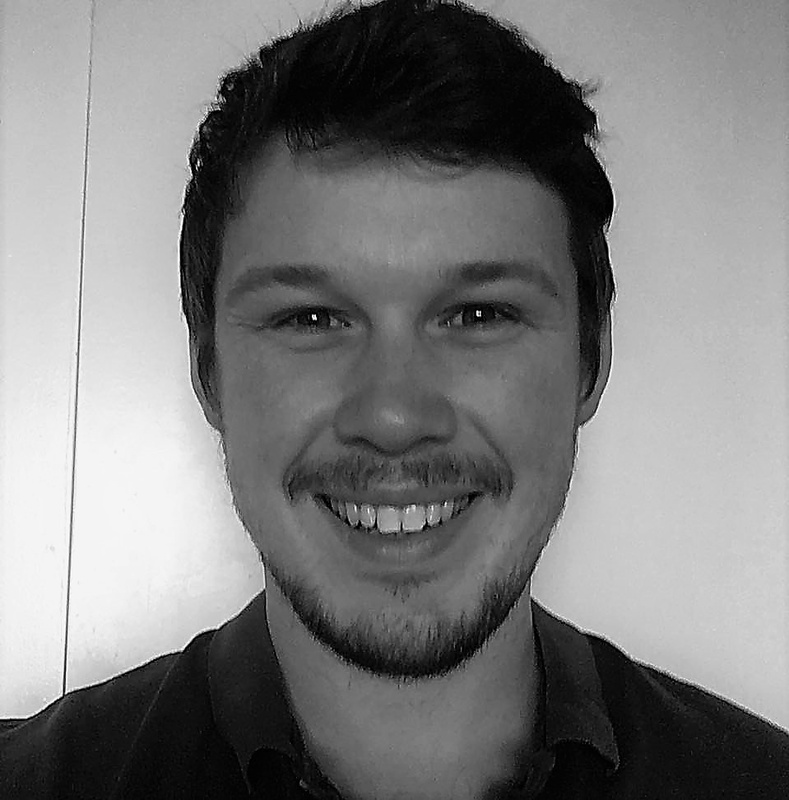 For this reason, Red Points has published research investigating counterfeits on Black Friday and millennials’ shopping patterns. Let’s take a look at some of the key findings. The research has shown that American millennials overwhelmingly prefer shopping online (72%) to going to brick-and-mortar stores (24%), with only a tiny minority (4%) still electing to shop via catalogs. This transformation in shopping behaviour isn’t just restricted to moving online - this year, more online Black Friday sales are predicted to come from mobile devices than desktops. This evolution in modern shopping will come as good news to counterfeiters, who have welcomed ecommerce with open arms. 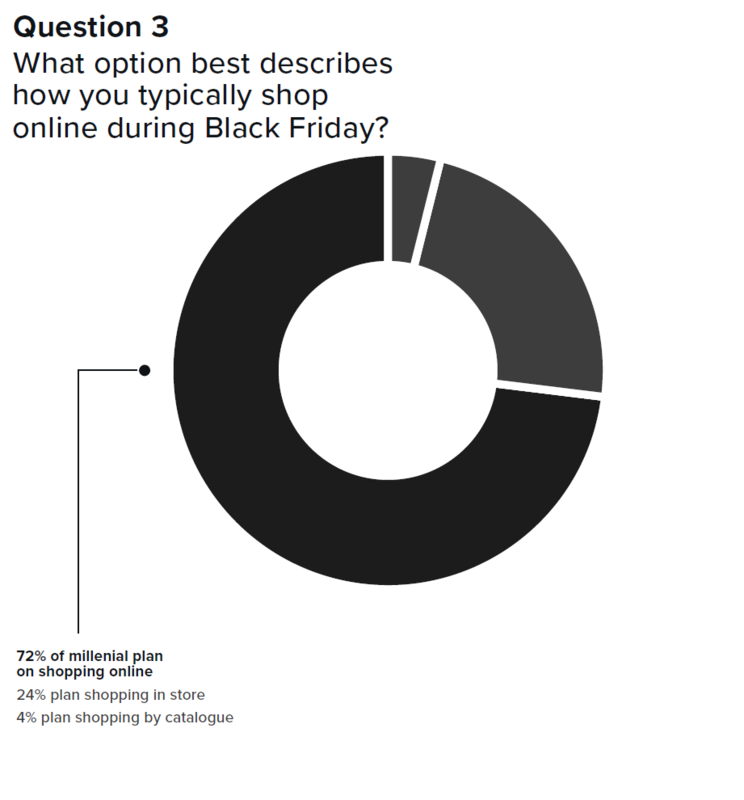 27.4% of millennials in our survey admitted to predominantly shopping impulsively online. What this means is instead of having a shopping list and specifically seeking out certain items, they simply browse online marketplaces and wait for appealing offers to appear. Impulsive buyers are especially likely to follow online promotional offers seen on social media (40.7%), far more than offers from other sources of advertising, including Google ads (17.6%), banner ads (17.3%) or on third-party websites (15.2%). Millennials are therefore vulnerable to scams and fakes sold on social media, which have ballooned in popularity with counterfeiters in recent years largely due to online marketplaces tightening their IPR enforcement, market segmentation tools and the incredible number of users. Though online marketplaces are far from a safe bet for ensuring a product’s authenticity, they are clearly more reliable than social media, considering planned buyers’ lower chance of having bought fakes. 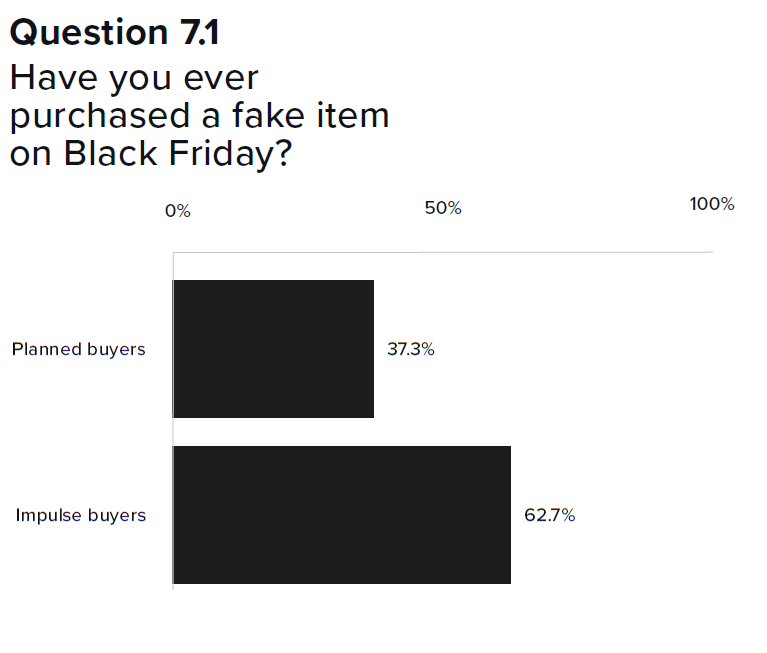 Surveying the respondents who were aware of having bought fakes in the past demonstrated the risk of impulse buyers trusting offers seen on social media. These posts were the biggest source of purchased fake products for impulse buyers, a trend Red Points has seen mirrored in our previous research into fake football jerseys and counterfeit cosmetics. Planned buyers were much less trusting of social media offers, and generally kept their shopping to online marketplaces. With Amazon, Aliexpress and others clamping down on intellectual property infringements in recent months, Wish has risen as a new favorite platform for counterfeiters. 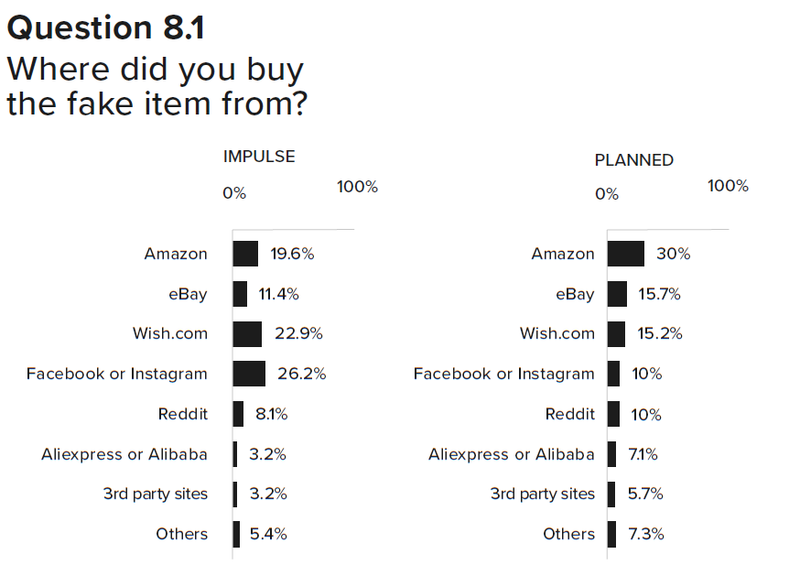 Again, impulse buyers demonstrate more risky shopping patterns, having bought more fakes from Wish.com than other marketplaces, despite Amazon’s dominance during the shopping holiday - the website claimed around half of the online sales during last year’s Black Friday. 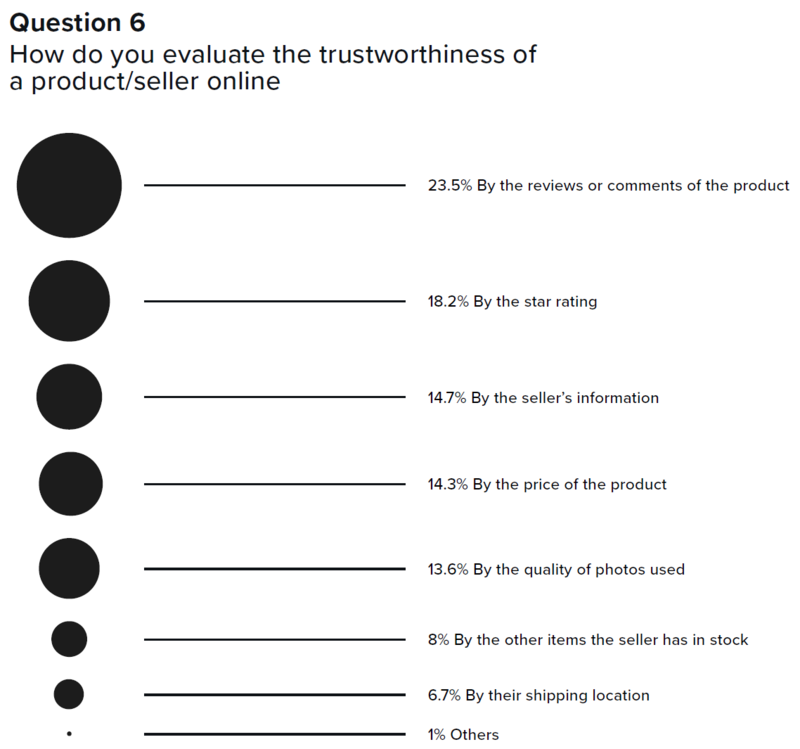 Respondents from our survey showed why they are so susceptible to buying fakes online. Deceptive counterfeits - fake products that are sold by imitating authentic brands and fooling consumers, as opposed to non-deceptive counterfeits which openly advertise their inauthenticity - use a number of effective strategies to fool online shoppers. Writing fake product reviews and comments, or incentivizing others to write glowing reviews for their knockoffs. Spamming five-star ratings on their products, and employing bots to do the same. Stealing product photos from the authentic brand, and posting it on their listings. This market research has shown that millennials use unreliable methods of determining product authenticity online, by trusting reviews and comments (23.5%), star ratings (18.2%) and photo quality (13.6%) to reflect the product’s authenticity. Even product price, which is usually a more reliable method of determining product authenticity, loses much of its ability to help consumers determine what is fake because of the nature of Black Friday - if there are considerable promotions and sales everywhere online, then it’s hard to say which price reflects authenticity. Seller information and other products the seller has in stock remain more trustworthy ways of checking authenticity. Dodgy-looking stores on online marketplaces, which are not verified by a brand, will still highlight a seller as potentially unauthorized. Similarly, seeing that the seller only stocks a poor variety of highly popular products from a single brand should raise red flags. Shipping location still works as a useful determiner for authenticity, too. Since most authentic brands stock nationally with Amazon and other online marketplaces, seeing a product being shipped from a foreign country, especially from nations such as China, Hong Kong, India, Turkey or Thailand, should be cause for concern for shoppers. Convenience is showing itself to be an incredibly important factor in consumers’ shopping decisions. This can be seen by the rise in consumerism online vs in physical shops, in shoppers’ growing preference for using their phones to shop, and to clicking on promotions seen on social media networks. While this can simplify consumers’ shopping experiences, it is also proving itself to be a helping hand for counterfeiters. Impulse buying online, especially from millennials, is clearly fuelling the sale of online counterfeits. Especially leading up to Black Friday, brands need to be more vigilant than ever with their brand protection by expanding and diversifying their online searching for counterfeits to include up-and-coming ecommerce sites like Wish, and by putting more emphasis on their social media brand protection. 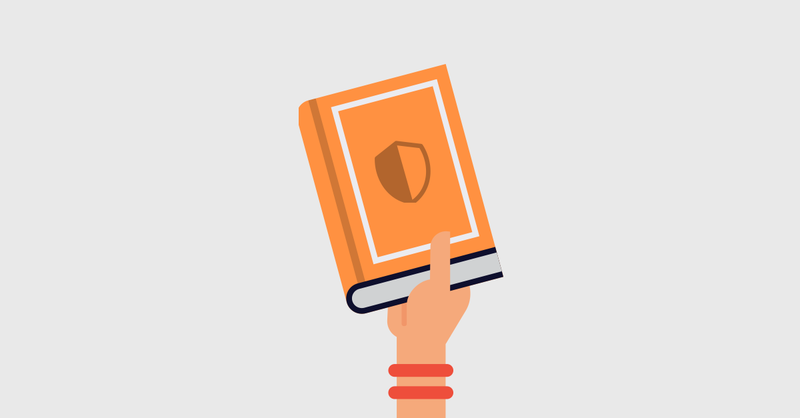 Brands are strongly recommended to educate their customers on how to spot fake products, and on best practices for maintaining secure shopping habits online - not only for a brand’s health but also for the protection of their customers who aren’t looking to buy fakes at all. For more insights into counterfeiting during Black Friday, and millennials shopping behaviour during the holiday season, click the banner below.